This bot mashes up the complete text of my 10 PRINT book and generates occasionally nonsensical but often genius Markov chain tweets from it. 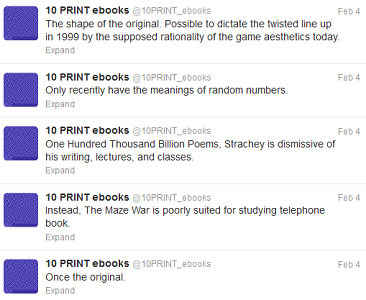 The bot also incorporates text from other tweets that use the #10print hashtag, meaning it “learns” from the community. [...]The 10 PRINT bot is built in Processing.